Citizen-scientist Kevin M. Gill created this color-enhanced image from data taken by the JunoCam imager from NASA's Juno mission. The spacecraft was 7,425 miles (11,950 kilometers) from Jupiter's glossy cloud tops and at a southern latitude of about 22 degrees when it caught this sight at 9:26 p.m. EDT on Sept. 6, 2018, according to NASA. NASA's Juno spacecraft caught a quick glimpse of a weather formation called a "brown barge" emerging from the silky bands across Jupiter's southern hemisphere. Since July 2016, the Juno probe has brought back a plethora of information about the gas giant planet. The mission has helped researchers arrive at new insights about the solar system's largest planet, including how the jet streams interact with ammonia clouds, why its moons create imprints in its electron aurora, and where on the planet lightning strikes more frequently, to name a few. The mission has also enchanted the public by supplying the raw data for magnificent images of the planet. 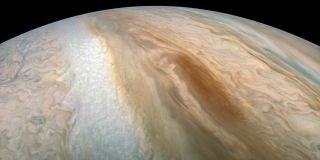 Brown barges usually appear in Jupiter's dark North Equatorial Belt, but this one formed in its southern counterpart, according to the agency. Brown barges usually vanish when the cloud band reorganizes itself within the massive Jovian atmosphere. The formations are sometimes hard to see, as well, because their colors can blend in with the material surrounding them. This brown barge pops out because the dark material of the belt receded, creating a light background. ''Juno is giving us the first glimpses of the detailed structure within such a barge,'' NASA officials said in the statement. Citizen-scientist Kevin M. Gill created this color-enhanced image from data taken by the spacecraft's JunoCam imager. The spacecraft was 7,425 miles (11,950 kilometers) from the glossy cloud coverage and at a southern latitude of about 22 degrees when it caught this sight. NASA officials said Juno took the image at 9:26 p.m. EDT on Sept. 6, 2018 (1:26 a.m. GMT on Sept. 7), as the spacecraft performed its 15th close flyby of Jupiter.